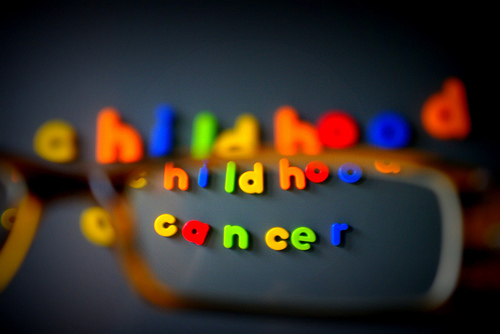 What are the risk factor and causes of childhood cancer? Cancer begins in the cells, which are the building blocks of your body. Normally, new cell form as you need them, replacing old cells that die. Sometimes, this process goes wrong. New cells form when you don't need them and old cells don't die when they should. The extra cells can form a tumor. Benign tumors aren't cancer while malignant ones are. Malignant tumor cells can invade nearby tissues or break away and spread to other parts of the body. Children can get cancer in the same parts of the body as adults, but there are differences. Childhood cancers can occur suddenly, without early symptoms, and have a high rate of cure. The most common children's cancer is leukemia. Other cancers that affect children include brain tumors, lymphoma, and soft tissue sarcoma. Symptoms and treatment depend on the cancer type and how advanced it is. Treatment may include surgery, radiation and/or chemotherapy. A risk factor is anything that affects the chance of getting a disease such as cancer. Different cancers have different risk factors. Lifestyle-related risk factors play a major role in many types of cancer in adults. Examples include being overweight, eating an unhealthy diet, not getting enough exercise, and habits like smoking and drinking alcohol. But lifestyle factors usually take many years to influence cancer risk, and they are not thought to play much of a role in childhood cancers. A few environmental factors, such as radiation exposure, have been linked with some types of childhood cancers. Some studies have also suggested that some parental exposures (such as smoking) might increase a child’s risk of certain cancers, but more studies are needed to explore these possible links. So far, most childhood cancers have not been shown to have outside causes. In recent years, scientists have made great progress in understanding how certain changes in our DNA can cause cells to become cancerous. DNA is the chemical in each of our cells that makes up our genes – the instructions for nearly everything our cells do. We usually look like our parents because they are the source of our DNA. But DNA affects more than just how we look. It also influences our risks for developing certain diseases, including some kinds of cancer. Some genes (parts of our DNA) control when our cells grow, divide into new cells, and die. Genes that help cells grow, divide, or stay alive are called oncogenes. Others that slow down cell division or cause cells to die at the right time are called tumor suppressor genes. Cancers can be caused by DNA changes that turn on oncogenes or turn off tumor suppressor genes. Some children inherit DNA changes (mutations) from a parent that increase their risk of certain types of cancer. These changes are present in every cell of the child’s body, and can often be tested for in the DNA of blood cells or other body cells. Some of these DNA changes are linked only with an increased risk of cancer, while others can cause syndromes that also include other health or developmental problems. But most childhood cancers are not caused by inherited DNA changes. They are the result of DNA changes that happen early in the child’s life, sometimes even before birth. Every time a cell prepares to divide into 2 new cells, it must copy its DNA. This process isn’t perfect, and errors sometimes occur, especially when the cells are growing quickly. This kind of gene mutation can happen at any time in life and is called an acquired mutation. Acquired mutations start in one cell. That cell then passes the mutation on to all the cells that come from it. These acquired DNA changes are only in the person’s cancer cells and will not be passed on to his or her children. Sometimes the causes of gene changes in certain adult cancers are known (such as cancer-causing chemicals in cigarette smoke), but the reasons for DNA changes that cause most childhood cancers are not known. Some may have outside causes like radiation exposure, and others may have causes that have not yet been found. But many are likely to be caused by random events that sometimes happen inside a cell, without having an outside cause.